Many people think of giving their kitchen a good scrub during the well-known spring cleaning season. However, it’s also a good idea to go ahead and deep clean your kitchen before winter arrives! This will cut your spring cleaning work in half and allow your kitchen to shine throughout winter. 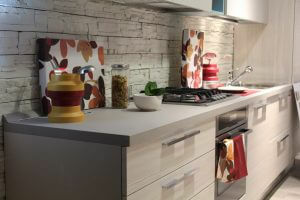 Are you looking to retouch your kitchen with stunning countertops? Check out our inventory. So you’ve already purchased beautiful kitchen countertops from Williams Fabrication, and now it’s time to tidy the rest of the kitchen. Giving it a deep clean will help make it sparkle and shine a little brighter! Take into account these tips to deep clean your kitchen. Many people use their oven every day to cook. It’s important to scrub your oven every few months to clean off food or juices that may have dripped to the bottom. If your oven is self-cleaning, let it do the work for you! Sweeping and mopping your tile floor is important to keep bugs from being attracted to your kitchen. However, every once in a while, grab a toothbrush and grout cleaner and scrub in between the tile. This will remove any food or dirt is caked in the cracks. Your kitchen hosts many dinners throughout the year. After 52 weeks of cooking, there is probably grease, food, and juice on your walls. Fortunately, there is a very easy way to clean your kitchen’s walls, backsplash, and cupboards! If walls could talk, they’d thank you for this much-needed shower. Sometimes, deep cleaning your kitchen just isn’t enough. You want a whole new look! If you want to give your home an even deeper fall refresh, contact us today about our beautiful kitchen countertops. The Most Important Room: Your Kitchen!